rather than a dreary mid-February feeling? 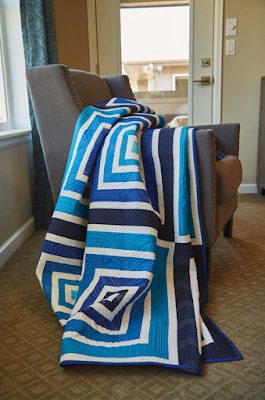 We'd like to introduce you to Kelli Fannin's "Blues Traveler" quilt, featured in the February/March 2018 issue of McCall's Quick Quilts. This graphic, monochromatic design is perfect for couch snuggles all year long! Kelli used five shades of blue from our Painter's Palette Solids collection, paired with white, to create a quilt that ripples with an optical illusion. 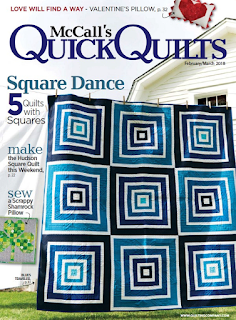 Below, Kelli shares more about her quilt design. Q. How did you choose the palette of blues? KF: I didn’t have a color palette in mind when I drew the design. The program I was using had graduated blues to work with, so I plugged in the different shades just to see if the design had depth. It looked really cool in blue, so I stuck with it. Q. How did you come up with the design? KF: This was my first foray into a log cabin type of design. It’s fun to take a simple block and make it look more complicated. I like depth in quilt designs—making things look like they’re three dimensional. I wanted to come up with a design that looked like it tunneled. Q. Did you design change as you worked on it? KF: I was originally going to use only one block, but it didn’t look right, so I added the second block. I thought that if I reversed the color order, one block would look like it’s going in and one would look like it’s sticking out. Q. What’s one thing we might not notice about this quilt at first glance? KF: The width of the strips isn’t uniform on both blocks, and that helps to enhance the dimensional effect. The white strips are positioned differently in both blocks for the same effect. Q. The machine quilting really adds to the design. KF: Pat Roche does amazing work. She always has a good eye for making the design stand out and I usually leave the decision up to her. She’s never disappointed me! Q. 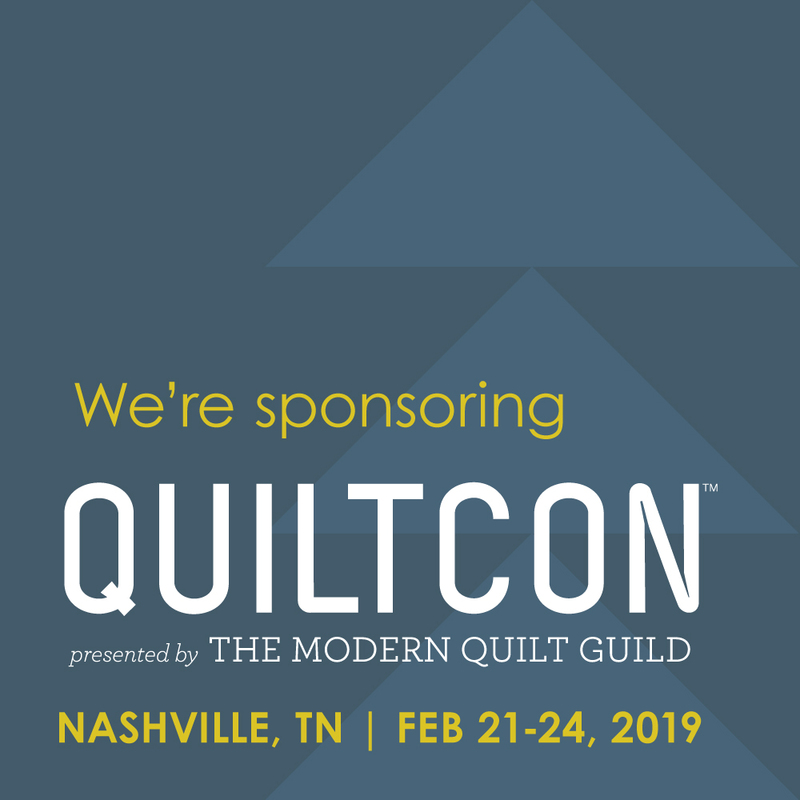 What is your favorite part of the quilt? KF: I think it’s the graduating colors. I was never a fan of blue, and it was probably the color I used the least. 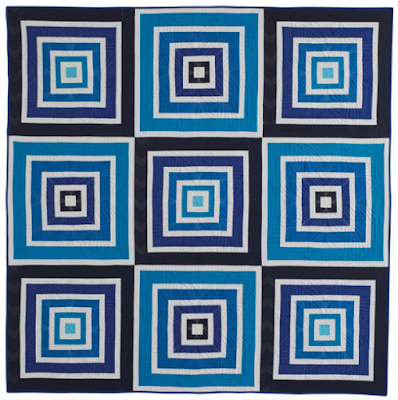 When I saw it in this quilt, it converted me to being a fan of blue! I'd love to see it in a rainbow palette as well. What color palette would you choose for this quilt? If you love the blues Kelli chose, you can make your own! Purchase the kit here. Purchase the individual Blues Traveler pattern here. See all 168 Painter's Palette Solids colors here. 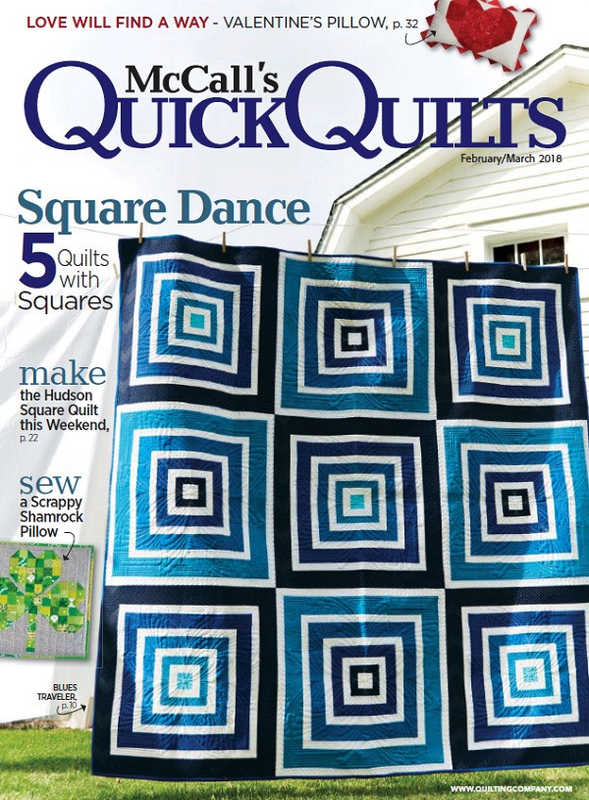 Find McCall's Quilt Quilts magazine here.